Before introducing the evening, our co-host and ISTD board member Freda Sack gave an impassioned speech in favour of experimentation in arts education, to much applause. In a politically turbulent time for the UK Freda spoke of the dangers of the proposed English Baccalaureate, which contains no creative subjects, an educational experiment we aren’t in favour of. Our first speaker of the evening was Malou Verlomme, co-founder of the foundry LongType, and since February senior typeface designer at Monotype. His first project was the update of Johnston, London underground’s iconic typeface, not a bad way to start life in London. 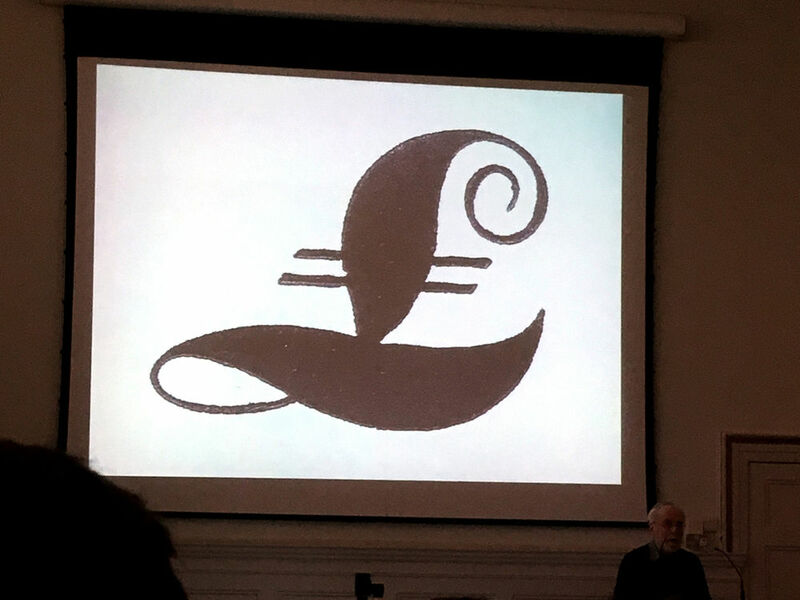 Malou began his talk with his chosen letterform, a rather eccentric but beautiful pound sign that he saw in a talk given by veteran typography expert and former St Bride librarian James Mosley. 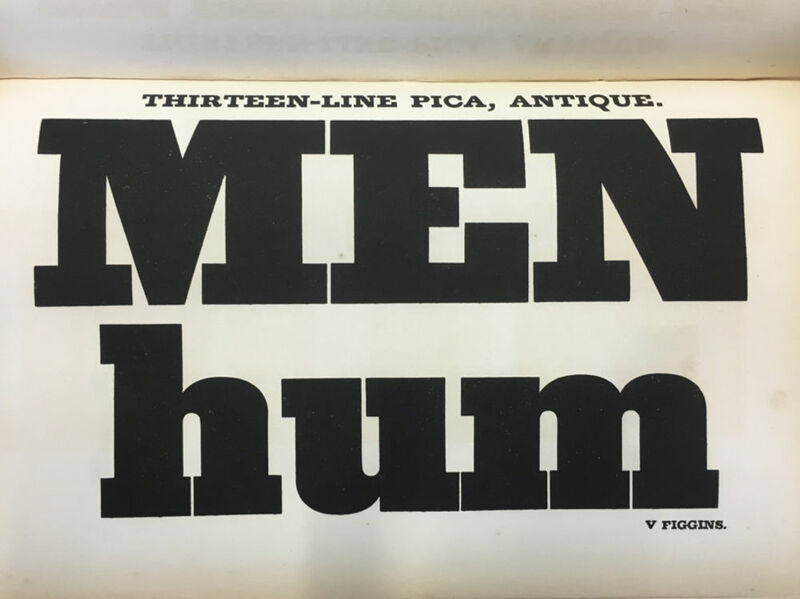 Next came another pound sign, this time from Vincent Figgins’ 1835 typeface ‘Four Line Pica No.11’, beginning what Malou termed “a typeface designer’s journey through 19th century display typography”. His history being from the perspective of a practitioner, rather than a historian. Malou explained that the typographic shift from ‘Old Style’ to ‘Modern’ paralleled the move from writing to engraving and showing us a helpful illustrated timeline from Jenson to Didot. By the 19th century however the rise of the poster led to a desire for “bolder and more eye-catching fonts”, the display typeface was born to “supply this demand” and Malou was here to talk us through the wide selection of styles that developed. 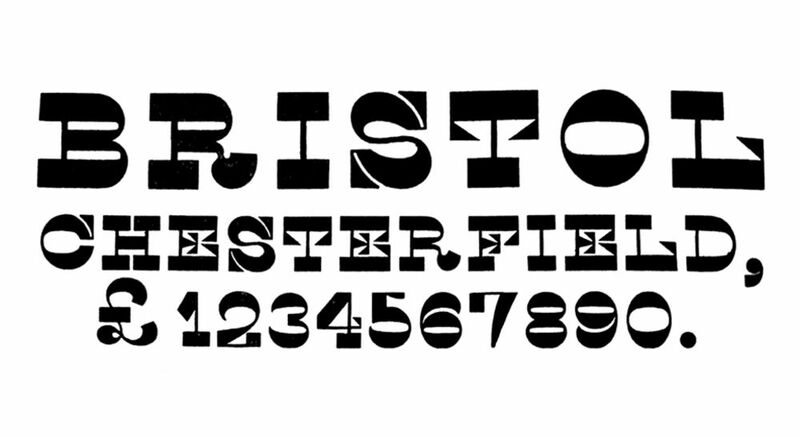 First came the “Fat Face”, which he described as a “Modern on steroids” with ultra high contrast between thicks and thins, typified by fonts by Caslon, Figgins, Thorne and Thorowgood. 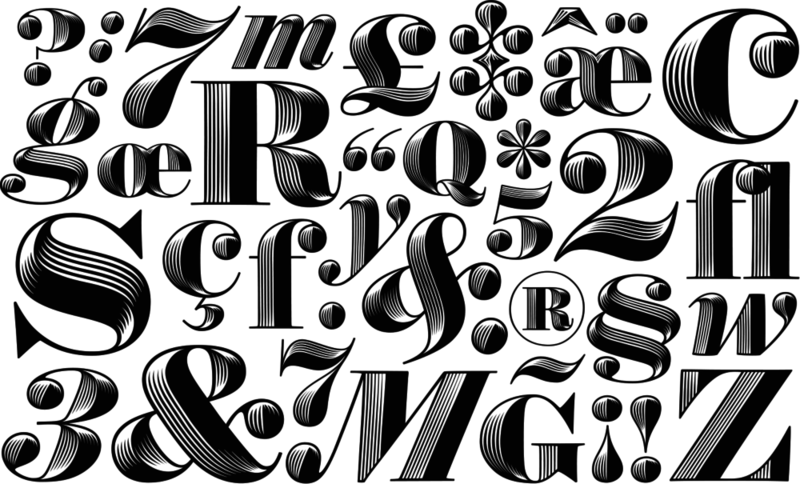 These typefaces are so extreme that “there is a pleasure not usually found in typography”. Then came the self explanatory “Slab Serif” (sometimes known as Egyptian), which brought with them extremely “tight side bearings” (the horizontal spaces either side of an individual character). This meant specimen books would often show these letters at a large scale, giving them “a kind of rhythmic poetry”. The next stop on Malou’s historical journey was the now ubiquitous but once revolutionary “Sans Serif”. This began in 1816 with William Caslon IV, but was later taken up by many foundries of the day. Malou pointed out some of the quirks and strange imperfections in may of these early Sans, speculating that their origins were probably to be found in Slab Serifs with the slabs removed. After this came the lesser known and even more quirky “Italian faces”, characterised by extreme contrast but with reverse stress. This means that the horizontals are ultra thick, rather than the verticals as is usually the case in “Modern” typography, creating eye-catchingly weird fonts. Despite their eclecticism, Malou explained that what all these styles have is “a common skeleton” onto which the variety is added. In all these 19th century type specimen books Malou enjoyed the “fun combination of words that are not really meant to be read” as well as the heaviness of the ink which sometimes shows through on the reverse of the page, and the oddities found on their online scans, such as the occasional gloved hand accidentally captured on Google Books. Malou, having covered display typefaces with a common skeleton, next took us to the world of structural variation and ornamentation, from drop-shadows to Tuscans and Florals. Culminating in the incredibly detailed work of Louis John Pouchée. 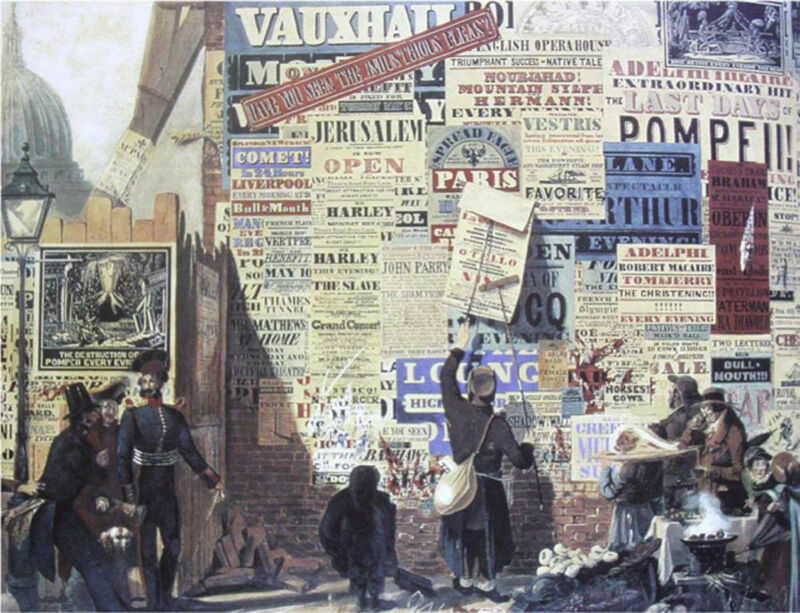 After this came a brief foray into 19th century poster design, a time when people weren’t afraid to use a different typeface for every line of text! It was around this time that “Chromatic Wood Type” was also invented, making use of overprinting to create a third colour out of two layered typefaces which had to be registered perfectly. Malou concluded his presentation on display typography by showcasing a few contemporary type families which have been inspired by the heritage of the 19th century but utilise modern technology to move them forward, such as Obsidian by Hoefler & Co, Dala Prisma by Commercial Type and Julien Priez’s Mandinor. Our next speaker for the night was Paul McNeil, a typographic designer with over thirty years’ experience, a Senior Lecturer in Typography at the London College of Communication and co-founder of MuirMcNeil with Hamish Muir. 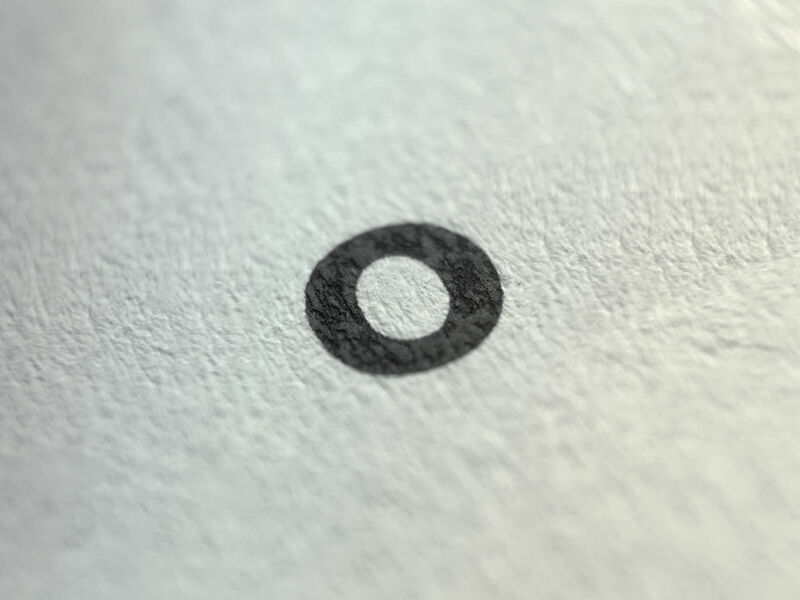 Paul began his talk with his chosen character – a lower case ‘o’– then revealed that in fact this is from a typeface which is the “opposite of experimental”, in fact the ubiquitous Arial. Paul chose this due to the context in which it was used, beginning an exploration of experimental writing that uses typography, rather than discussing experimental typeface design itself. The Arial ‘o’ proved to be from Bruce Mau’s Can we envision, a written numerical list of speculative and conceptual ideas for typefaces (e.g. “7: an apolitical font, a font that doesn’t care”) which challenges designers to think differently about what design can do. From here Paul moved onto some early examples of writers using experimental typographic layouts in their writing, such as the page design of The Mouse's Tale poem found in Lewis Carroll’s Alice's Adventures in Wonderland and the work of the French poets Mallarmé and Apollinaire. After this came a look at writers who have been experimental through their rejection of certain grammatical or typographic conventions, such as Oulipo member George Perec’s 1969 novel La Disparition (The Disappearance) which never uses the letter ‘e’ in its 300 pages, and Peter Carey’s novel True History of the Kelly Gang which doesn’t contain any commas. Jonathan Safran Foer is another writer who Paul wanted to highlight, for Foer’s article About the Typefaces Not Used in This Edition a work of fiction which invents and describes impossible and poetic typeface, and A Primer for the Punctuation of Heart Disease which makes poignant use of various typographic symbols. 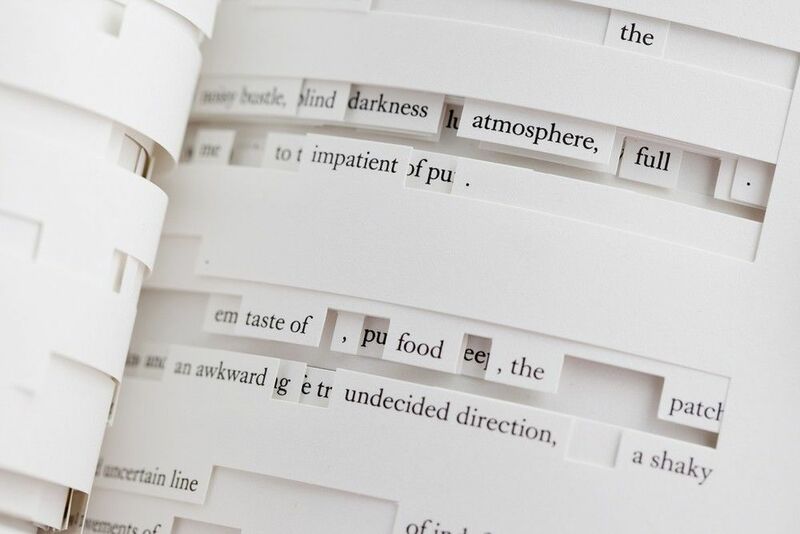 Paul went on to show Foer’s unique book Tree of Codes which is “as much a sculpture as a work of fiction”, created by cutting away at Bruno Schulz's book The Street of Crocodiles. Next Paul showed the American writer, and former graphic designer, Dave Egger’s fictional products sold at Brooklyn Superhero Supply Co., an innovative children’s charity. The exploration of experimental writing continued with Shelley Jackson’s The Melancholy of Anatomy a novel tattooed “word by word onto different people”, a phonetic alphabet designed by Kurt Schwitters, Henri Michaux’s ‘Untitled Passages’ which blended text and image under the influence of the hallucinogenic drug Mescaline and the Chinese artist Xu Bing’s Book from the Sky. A work which is filled with meaningless symbols designed to resemble traditional Chinese characters. All these examples for Paul show “utopian notions of language” and that “text doesn’t need to be a vessel for words”. This theme continued with a look at the invented alphabet from the sci-fi film District Nine, Egyptian hieroglyphics and John Wilkins’ “Real Character”, a 17th-century attempt at creating a new universal language for scholars based on “concepts not sounds”. 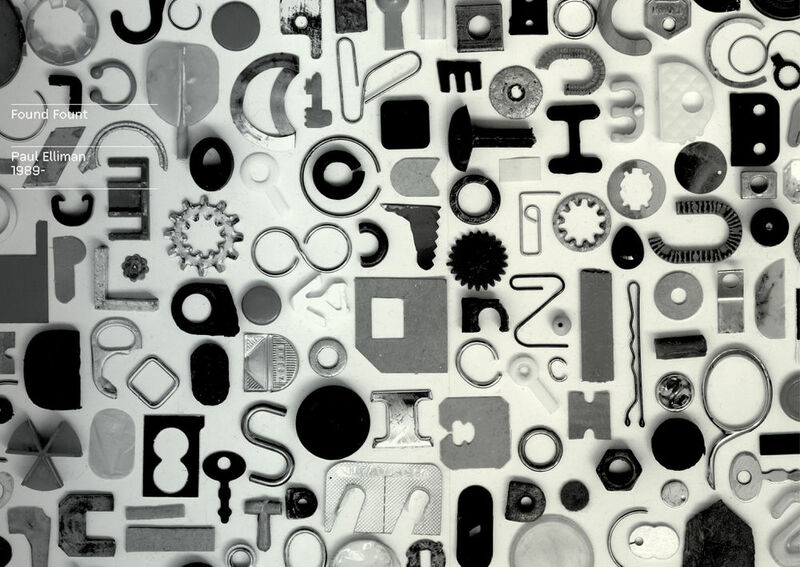 The talk concluded with the work of Paul Elliman, whose Found Fount project is a collection of letterform shaped man-made detritus, all of which must be small enough to fit in the mouth. Continuing our night of experimental typography, we welcomed our next speakers, Elisabeth and David from The Counter Press, a design studio, letterpress printers and typographic workshop based in an old chocolate factory in East London. They began by admitting that because of “the sedate pace of letterpress” they wouldn’t usually consider themselves very experimental. So instead they explored “what experimental means to us” after finding that everyone they asked had a different opinion on what constituted as “experimental” in typography. Elisabeth and David concluding that for them, experimental was all to do with the “context of the time, and the problems that had to be solved” rather than style. The letterform they chose to begin their presentation was a ‘G’ that doesn’t look very experimental now, but was in fact from the first ever sans-serif typeface, designed by Caslon in 1816. This pioneering font didn’t really take off right away. 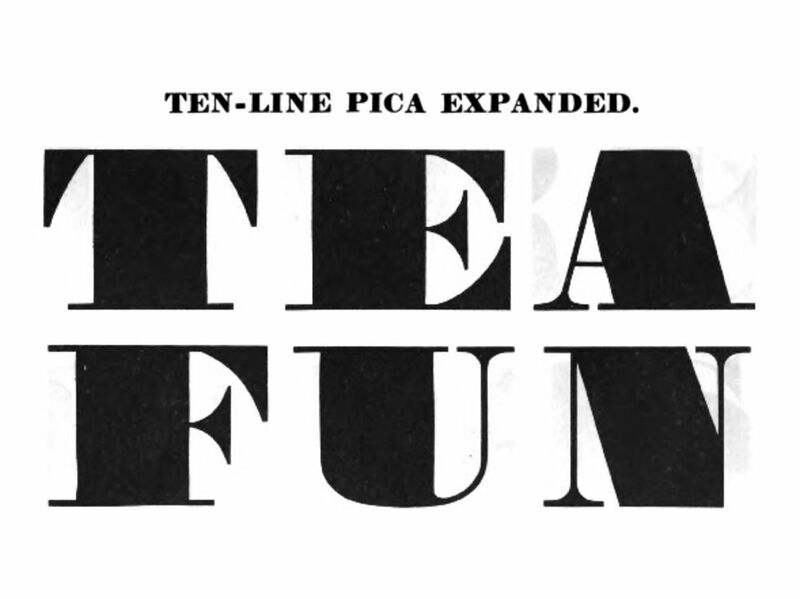 Elisabeth and David pointed out that it would be another 16 years until a further sans-serif appeared, Vincent Figgins’ ‘5 Line Pica’ in 1832. 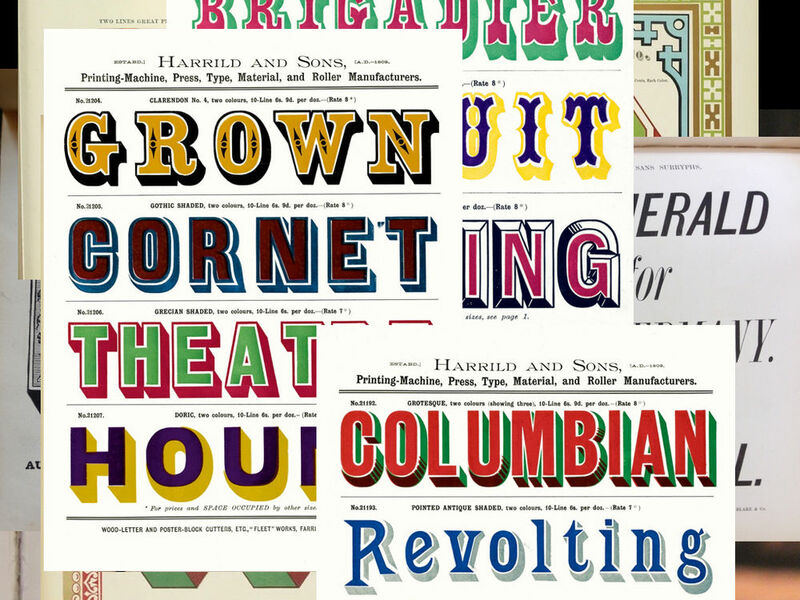 The first lower case sans-serif font, Thorowgood’s ‘7 line grotesque’ came out in 1834. There was a bit of confusion about what to call sans-serifs, the first was called ‘Two Lines English Egyptian’, but these sans-serifs were also sometimes called grotesques (or grotesks), Doric, Gothics or even sometimes Antiques. Their usage was primarily on architecture in the early days, but by the 1860s people had got more used to them, and new weights and sizes began to appear, and were used for setting text for the first time. 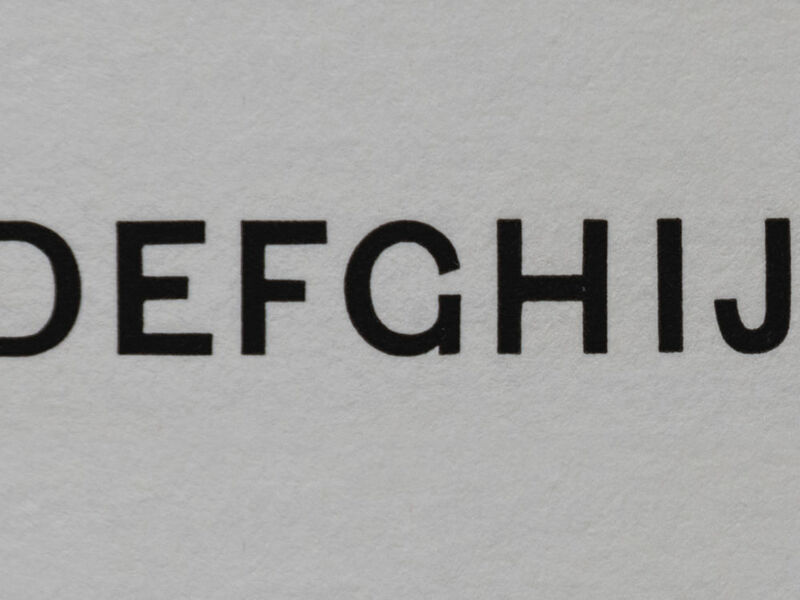 Yet for some these sans-serifs were still “too naïve or ugly”. But a boom in print and advertising would soon change that, and would require larger bolder type which the sans was perfect for. This shift from books to posters lead to “ornamental sans type, italics were introduced, more weights and detailed 3D effects”. Sans-serif typefaces which had often been “derided as too simple” became the perfect base on which to experiment with ornamentation and new effects. Then we took another look at beautiful chromatic wood type, which as letterpress printers, Elisabeth and David really appreciate for both their innovation and the level of expertise and accuracy involved. They also showed us some incredible and extreme 19th century examples of ultra-fat or ultra-condensed sans-serif typefaces. The Counter Press concluded their presentation by continuing this sans-serif story up to the modern day. Beginning with Edward Johnston, whose iconic London Underground font Johnston Sans came exactly 100 years after Caslon’s original sans-serif. 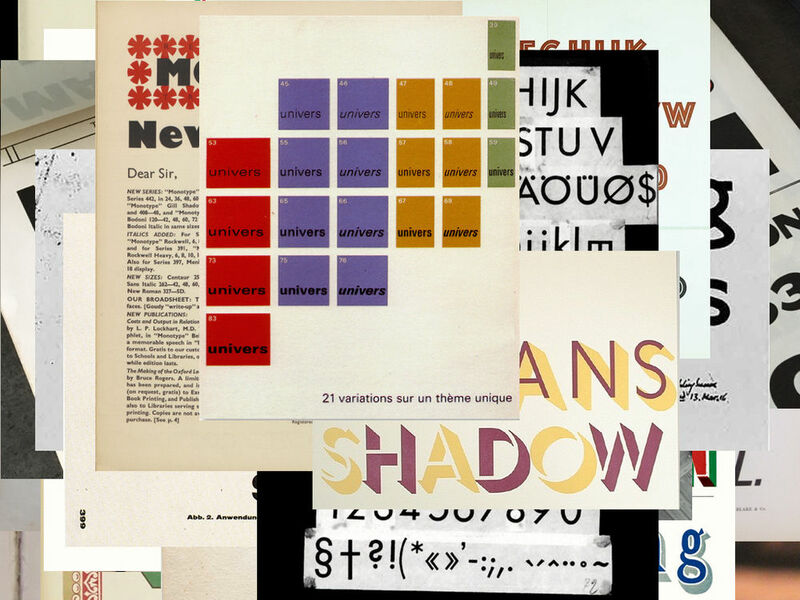 This typeface kicked off the “new sans movement” inspiring the likes of Futura, Gill Sans and Univers. Elisabeth and David think that even “two hundred years later there is lots of experimenting with sans still to do” especially with new technology, which always leads to experimentation. Their conclusion was the inspiring reminder that sans-serif’s were “a failure at first” but went on to take the world by storm. Up next was Peter Cronkrak, a London-based designer, artist and data visualisation expert who goes by the nom de guerre ‘The Luxury Of Protest’. Peter began with a startling confession; he hasn’t really touched type in his work for the last 3-5 years, and nor had he picked a single letterform. His choice was in fact a “symbol system” from “The Book of Pleasure (Self-Love): Psychology of Ecstasy” a 1913 book written by the English artist and occultist Austin Osman Spare. 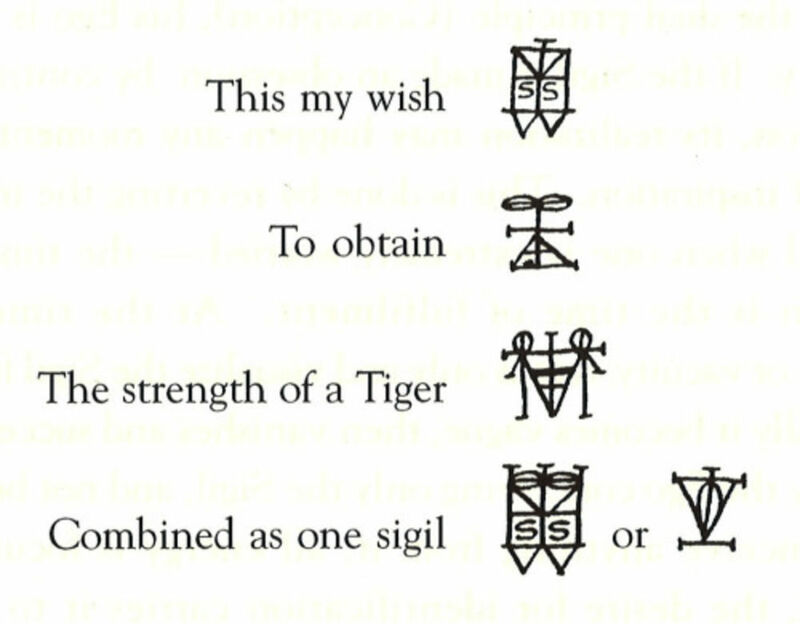 This symbol system was known as ‘sigils’, symbolic representations of a desired outcome, which could be combined into one symbol representing more of a complete sentence. Spare was interested in the occult and practised automatic writing, writing said to be produced by something other than the conscious intention of the writer. Working while in a kind of trance, he hoped to find the “truism of existence” tapping into the “unconscious part of the mind to produce art”. He used a form of automatic drawing also, creating grotesque and highly sexual work in a kind of art nouveau style. He was “the first surrealist” by about ten years, and could also be “considered the first pop artist” because of his portraits of the celebrities of his day. For Peter, his work is interesting because of its automatic nature and how he managed to achieve a kind of “objective representation of self”. Making Spare one of the “first generative artists”. 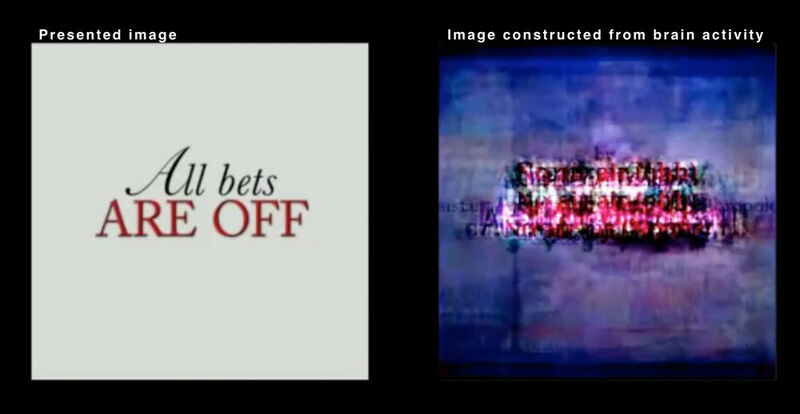 Peter in his own work tries to achieve something similar “transcribing the mind in a visual way” and taking personal “creative decisions” out of his own process, he allows his work to be driven by the data itself. Peter ended his talk with a scientific twist, talking about a recent discovery that “consciousness is a state of matter, and could theoretically exist outside of the body”. He then proceeded to show us the “most amazing but frightening thing he had ever seen” an experiment where using “fMRI and computational models, UC Berkeley researchers decode and reconstruct people’s dynamic visual experiences… allowing watching one’s dreams on YouTube”. Peter ending his talk with science and actual experiments linked nicely into our final speaker of the night, Sarah Hyndman a graphic designer and writer who launched the unique studio Type Tasting in 2013. Sarah began with the letterform of her choice, the ‘s’ from 2 fonts combined in a 50/50 split, which we are promised will be explained later. The experimental theme meant that she could “finally get to be totally literal” since a lot of her work involves experiments. Sarah continued by talking about how “reading is magic” explaining that once learnt “the subconscious does it without you”, allowing your eyes and brain to work in tandem. This brought her onto ‘crossmodalism’, one of her main interests, which she explained is the study of how “one sense causes a response from another sense”, for instance how smell can evoke an image. This idea inspired the first experiment she did with our audience, asking us to pair up three smells with three different fonts. The results were pretty unanimous, bubble-gum was round and soft, lavender old fashioned or delicate and chilli was spiky. but Sarah explained that how much people enjoy spicy food and whether they use lavender scented cleaning products can affect the results for some individuals. Sarah describes this as a kind of learned synaesthesia that everyone develops through experience and associations. This sort of thing could be used more to create a kind of “Proustian sensory branding”. She then explained a past experiment where people smell the same scent but out of bottles with two different typefaces on, one a delicate script, the other a bold sans-serif. 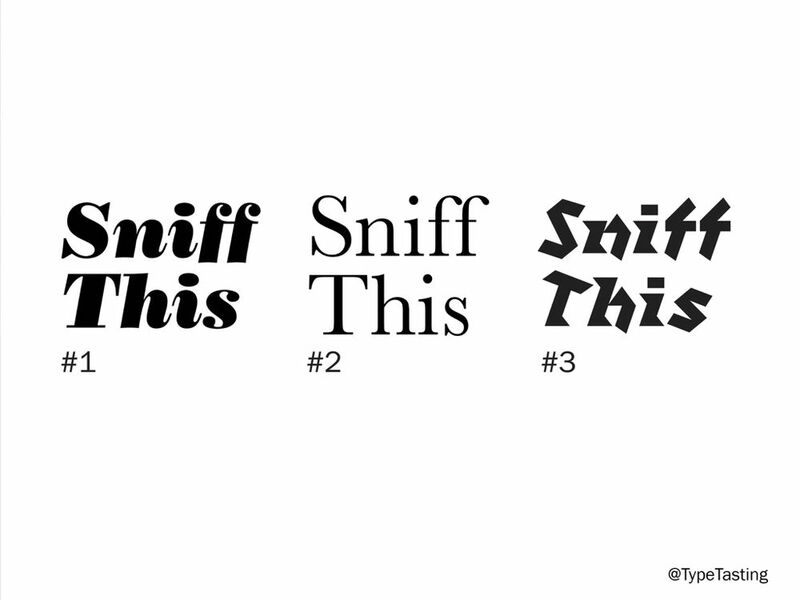 The result was that 1/3 of people considered them to be different smells, all because of the typeface choices. Sarah has also found that fonts can affect peoples sense of flavour, while another experiment found that people would assume a chef was more skilful if they used a serif font on their menu rather than a sans serif. 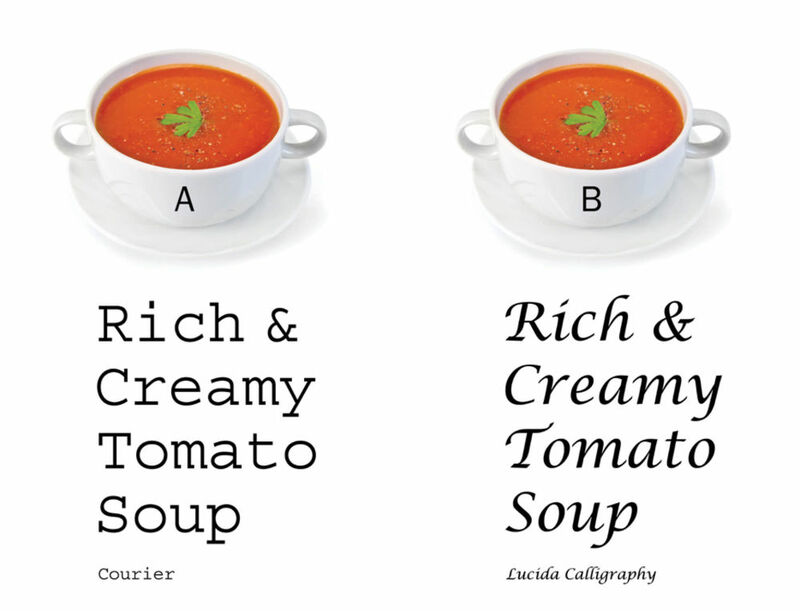 A study by the psychologist Dr. David Lewis found that when given two identical tomato soups, one using Courier on the label and the other using Lucida Calligraphy, 64% of participants rated the one using Lucida as tastier, and twice as many said they would buy it for themselves compared to the soup which used courier. Sarah next explained the “Kiki and Bouba” experiment, something first invented in the 1920’s, which involves assigning the names to two different abstract shapes, one round the other spiky. Our audience was again unanimous, the round shape was Bouba and the spiky Kiki, the same instinctive results have been found across the world in all different types of societies. 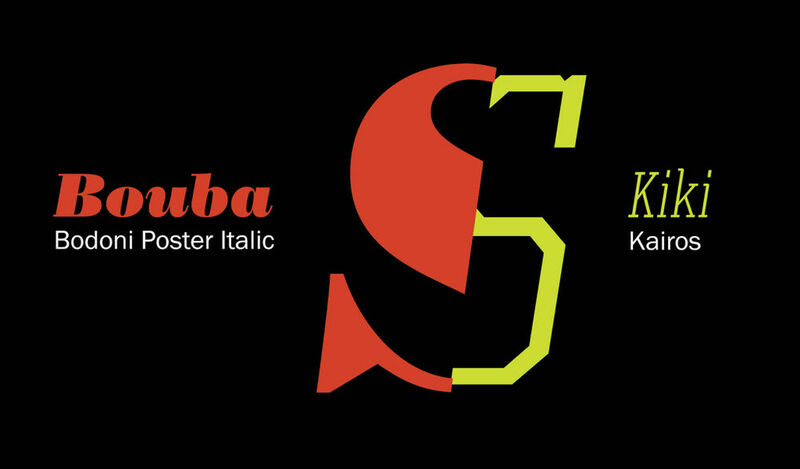 The same logic can of course be applied to typography, we found that serifs made a font more ‘Kiki’ and anything angular didn’t suit ‘Bouba’. Sarah ended the night’s presentations by explaining that this science of pairing speech sounds with visuals is important in the world of naming, without it things can sound instinctively wrong or uncomfortable. The evening ended with questions to our speakers from the audience, before everyone retired to the bar for drinks, a chat and another chance to have a look at Sarah’s experiments. Special thanks to all of our speakers and to Monotype and the ISTD for their ongoing support. The next Letterform Live event will take place in September.